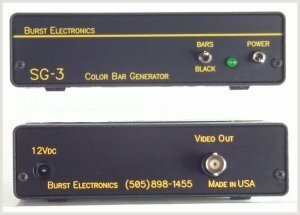 The SG-3 SMPTE Color Bar/Black Burst Generator is a low cost unit that produces the SMPTE Color Bar pattern and black burst. A front panel switch selects either Bars or Black for the output. ID option available on both black and bars output. Options: Y/C (S-video/S-VHS/Hi8), ID, 1 kHz tone, Rack mount. 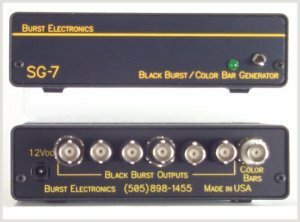 The SG-7 Generator outputs SMPTE Color Bars and 6 outputs of black burst simultaneously. An ID option is available on the bars output. NTSC only, not available in PAL. Options: ID, 1 kHz tone, Rack mount.